August 2016... we accepted another invitation through the same international cultural network to showcase our artwork again and share in an exchange of techniques and ideas during our cultural touring program in Asia. Our Chinese friends were very interested and appreciative of Australian artists' ideas and work practice. 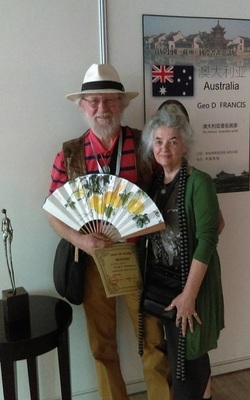 Translation was competently aided by Louise Wu throughout our visit. ​cultural exchange. A surprising but delightful consequence of the Expo Milano gold medal experience. On stage with Mr Gu Fuhai, Chinese Painting & Calligraphy & Max Panero, Qualitaly Cultural Association signaling goodwill & friendship across cultural borders. 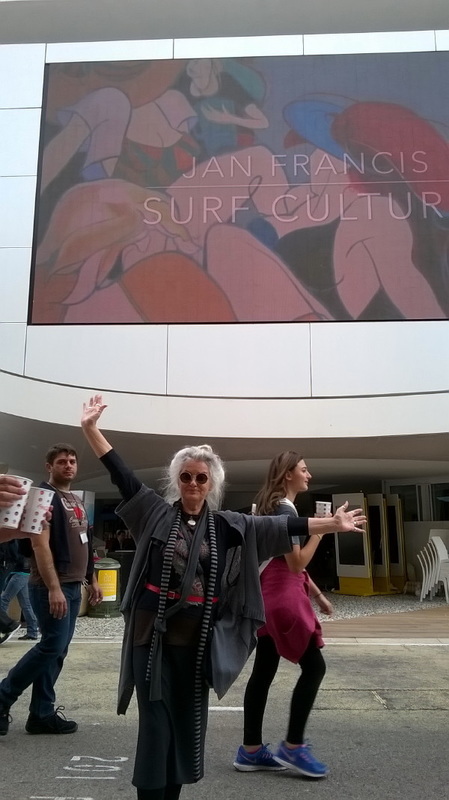 We were thrilled when Jan received a Gold medal and Merit certificate for her canvas SURF CULTURE in the International Art Contest held in the Chinese Pavilion at EXPO MILANO 2015 Italy. Milan Expo was a dynamic showcase of cultural diversity from around the world and we felt privileged to experience it over 3 days. 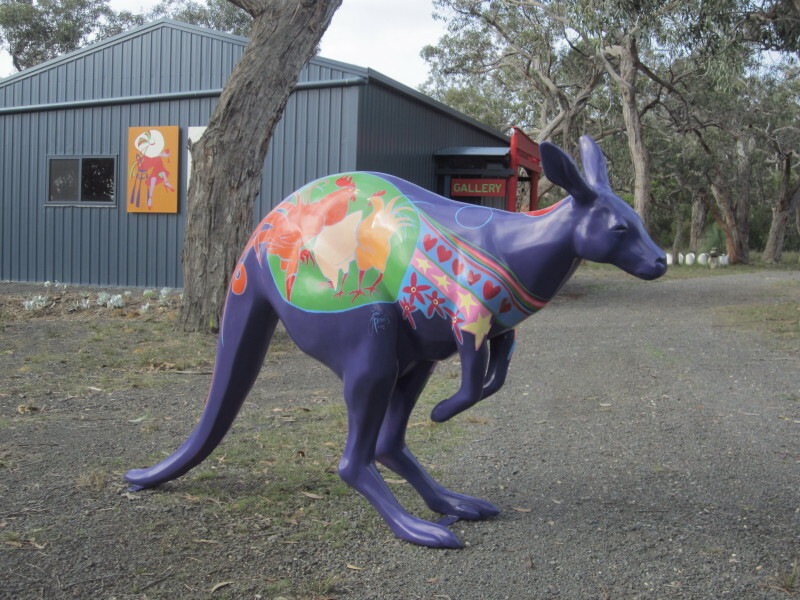 Jan was delighted to be invited as one of the 40 artists to paint a Roo for the Hop for Hope project, inspired by the Alannah Madeline Foundation which protects children from violence. The theme was HOPE......... Cockadoodle Roo was born because the rooster celebrates the hope and promise of each new day. Vipond colours were mixed to respond to this uplifting message. All 40 Roos will be displayed at Yarra Valley Chocolaterie & Icecreamery before being auctioned on-line later in the year. 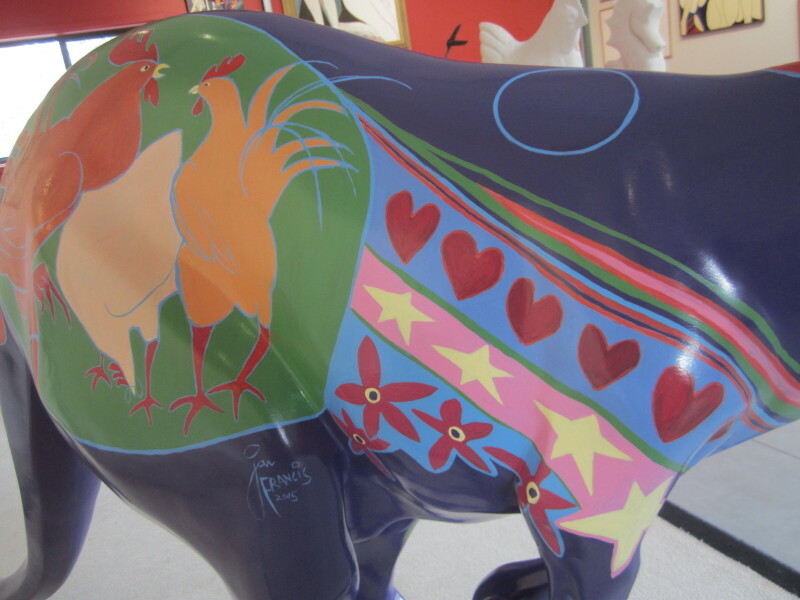 Big Roo arrived in Jan's studio, the design stage commenced with Baby Roo as inspiration and before long the finished Roo was out and about at Moongate. MOONGATE GALLERY was opened in July 2014 and featured SOLLUNA, an exhibition inspired by our recent sojourns to Japan and the ancient wood-block prints of Master Yoshitoshi. We have now launched our second exhibition and inaugural book launch of THE WHITE BROAD BRIMMED LINEN SUN HAT. This World Premier held the last day of Autumn 2015 was a triumph! The little book with text by Geo's cousin Graeme Hubbard and illustrations by Jan Francis, was signed and appreciated by an enthusiastic crowd. An offset printed portfolio of both the 13 drawings and accompanying text was also launched supported by relevant oil paintings and sculpture throughout the gallery. For enquiries or sales call 0414 876 383. An elegant contemporary sculpture, TANGO is inspired by the Latin dance genre of passion and seduction. It embodies many of the attributes of a good gallery experience.... the seductive invitation, the anticipated moment to linger and explore and the playful, joyous experience of discovery. Attractively coloured, TANGO displays a boldly striped stocking to turn the head and catch the eye. Long legged with a head of free flowing hair, TANGO can also speak of the natural rhythms and sensuality of the surf culture and the beautiful coastal environment. For some time, Bruno and Nadia Rocchi dreamed of a sculpture for their gallery garden. It had to be large and eye-catching. We accepted the challenge and the process began. The journey took nearly 18 months and, peppered with much dialogue, debate and fine wine, the team progressed steadfastly toward a desired outcome. On June 29 2012 TANGO was installed, with a champagne toast the following day to celebrate its home-coming. 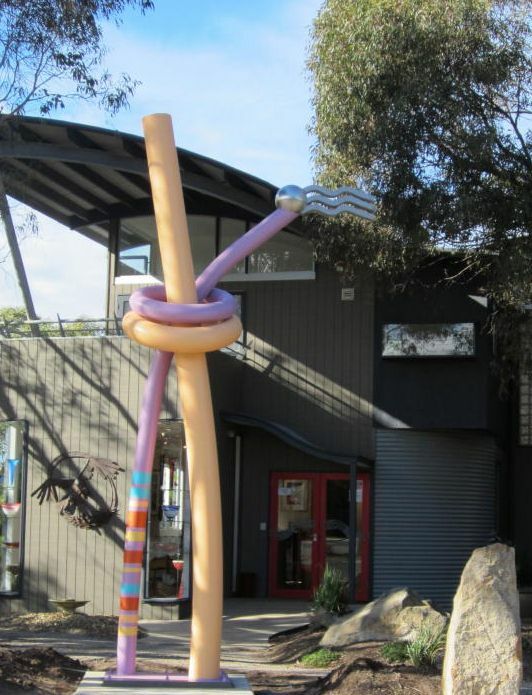 PIPELINE is now installed at the new Surf Coast Civic & Recreational Precinct in Torquay. PIPELINE is elegant and simple in design. It is a positive and uplifting earthy orange statement in the landscape, yet surprisingly has a theme that is strongly water based. 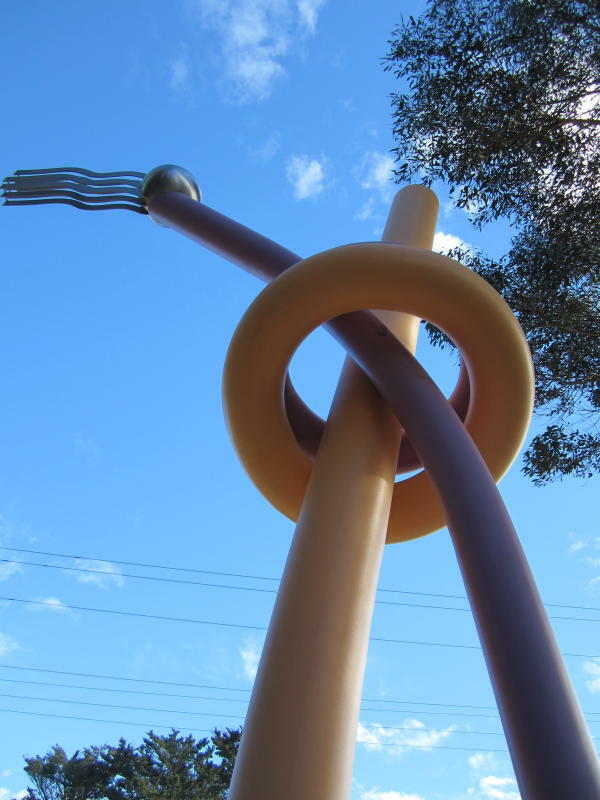 It not only celebrates the beautiful coastal curves and wave movements of our surf culture, but also the river waterways from the hinterland to the sea and the rich environmental diversity of the broader Surf Coast Shire. 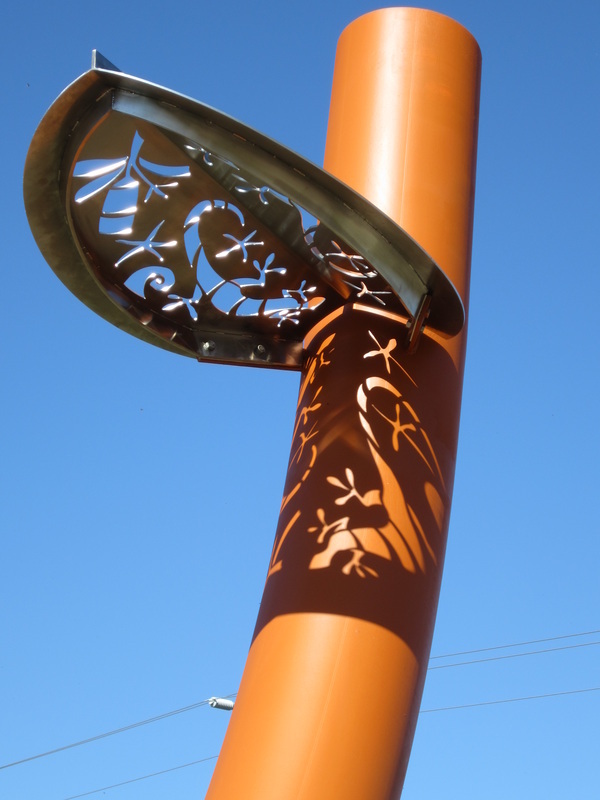 The stainless steel leaf component carries cut-out indigenous motifs, which acknowledge the original custodians of the land through the celebration of our flora, fauna and the coastal environment. This symbolic leaf is playfully carried on the water icon from the hinterland to the sea, its shadow play in tune with the time and season.